A smelly sock smell???!!! LMAO what does that say about the likes of me???!!! Ok no comments to that one please Then again Hollie how did you come up with that analogy?? What do you spend what little spare time you have doing??!! The mind boggles! My son-in-law used to duck down to the floor trying to avoid one of the sennies, of course she'd think it a game and land on him he'd scream & shout get her off get her off, naturally we fell about laughing, dear little bird only wanted to give him a loving nip! LOL that made me laugh tasha, because I sent shell a message the other day saying ooooh I just sniffed your t-stand and it smells of macaws I wasn't actually sniffing it, I picked it up to move it and got a whiff of what was most definately macaw smell. I love it, so I had to make sure and have another big whiff! Its damp smelly musty socks! That's what they smell of! That's what they smell of to me anyway! Hiya Clive, nice to see you're joining us. Had to add my thank yous along with everyone else on here for all you've done for Jasper, you're a star. I live with a man who thinks its perfectly acceptable to leave his smelly, musty socks wherever he feels like it for me to pick them up! And again, thank you for giving Jasper the chance to have a lovely home and for taking the trouble to go an get him back! Again as already said, thank you for your help with Jasper! Hollie you do realise Clive is going to read all of this and realise we're madder then a bottle of frogs?! The poor fellas had many a conversation with me over the last week or so, I hope he knew what too expect! Oh yes, I can verify that one! Awww mine are lovely, they have got attitude though. The two disabled babies from lee, who aren't really babies anymore (but are to me ) fluff up like macaws and do the swaying thing when confronted with something they take affront to (usually my fingers lol). The other two conures look at them as if to say, ahhhh the joy of youth! Aww I can sympathise Clive. Penzo (a Grey) bombs me when Jon is around and actively seeks me out! He's getting better with me or I'm getting better with him - not sure which way round that is . My reflexes have certainly improved! Galah's........they pick their own! I have 4, 1 male who follow one of the girls about, she's not interested, the other two girls preen each other, one of them follows the male about and he's not interested! I think they are really fussy! 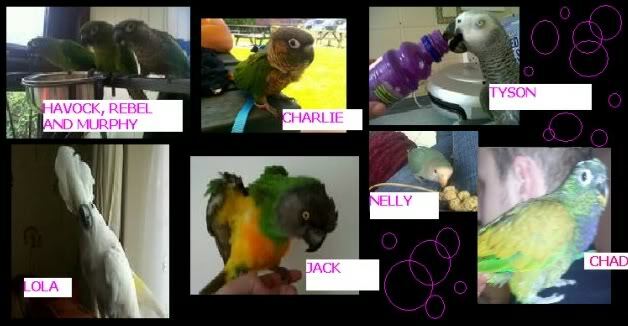 All my birds are indoor birds, though they all go out into the aviary daily. The 3 girlie galah's share a cage but the male is next to them in his own. We've had galah's for about 6 1/2 years, well the firt one then the second was a year later. The caiques are gorgeous but very naughty. they are loud, louder than the others, and think they are eagles! They attack the other birds. If they are the only birds then they would be great.